One of the bonuses you receive when designing a custom kitchen is the opportunity to maximize storage and organize everything exactly according to your needs. 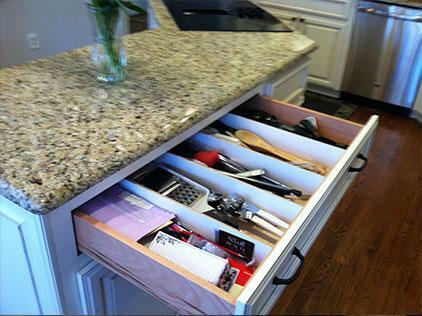 Specialized storage that is well designed helps eliminate wasted space in the kitchen. The storage details you select should reflect your needs and those of your family. Even if you’re not planning to remodel your entire kitchen, we have several tips and creative solutions that will make your cabinets more efficient. The way you configure the “inside the cabinet” storage is as uniquely individual as the overall kitchen design. The key is having a great designer that listens and understands your needs. Your space will work best when it is functional, so pay careful attention to the detailing of the interiors of your cabinetry. Traditional rollout shelves come in handy when you prefer the aesthetics of doors over drawers. You must take care, however, to fully open the door before pulling out the shelves to minimize the inadvertent scraping of the inside of the door. The shelves come in a wide variety of traditional and other materials, such as this wood dovetail version. A base cabinet with a standard door can usually accommodate three shelves, depending on what you need to store. Look at the details in your kitchen (or soon to be remodeled kitchen) and ask yourself a few questions. 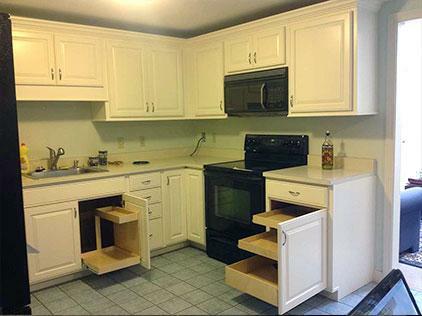 Does your kitchen storage help or hinder your organization efforts? Is it designed in a way that also helps your family stay organized? Is there a place for everything? What could you change that would make it better for the way you use the space?